Another recent news to spread today. 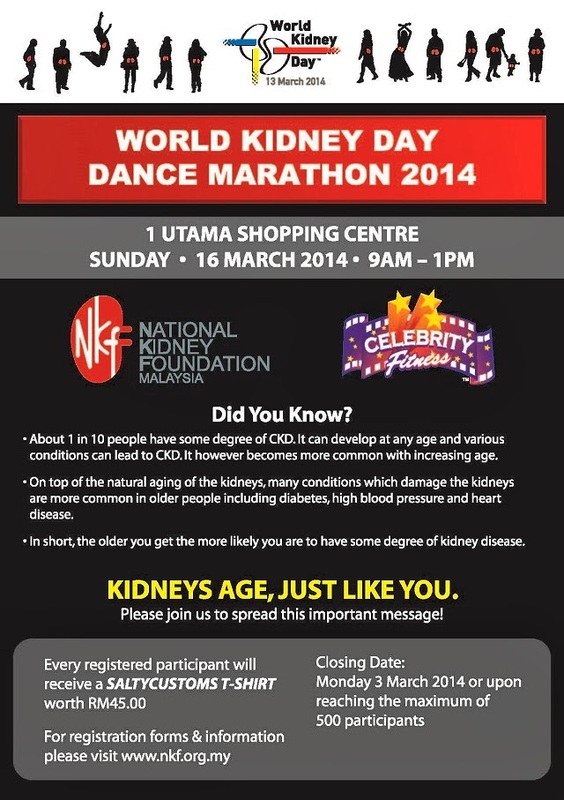 In conjunction with World Kidney Day 2014, National Kidney Foundation Malaysia (NKF) and Celebrity Fitness Malaysia are organizing a Dance Marathon on 16 March 2014 (Sunday), 10am at 1Utama Shopping Centre. Led by Celebrity Fitness instructors, get ready to dance for three straight hours for a good cause. Monies raised will go towards the betterment of underprivileged patients with kidney failure. Participation fee is only RM 30 per person and registration will close on 3 March 2014. Space is limited to 500 participants. The objective of this event is to encourage members of the public to come forward to exercise through dancing and to do it for a good cause - i.e. to raise funds for poor kidney patients under the care of NKF. There will be no winners for this event. This event is to raise funds as well as to create an awareness and educate the public on kidney disease. We want everyone to come forward to exercise, sweat and have fun! There will be lucky draw prizes and every participant will be eligible for the draw. Members of the public can register at http://www.simplygiving.com/event/WKDDanceMarathon2014 or download the participation form from www.nkf.org.my.